Cambridge is one of the best cities in the UK for students, with top live music venues and theatre, great food, shopping and breath-taking architecture, there's something for everyone here. The Cambridge campus is in the very heart of city centre, close to shops, bars, restaurants, green open spaces and the trendy cafe and independent shopping area, Mill Road. On campus services provided by the Union include access to an array of volunteering opportunities, a free and confidential Advice Service independent to the university, plus loads of evening and day-time events and more than a hundred societies you can sign up to. Come and find us in our beautiful space on the ground floor of Peter Taylor House. And it doesn't stop there! Our on campus venue, The Academy, hosts fantastic events throughout the year, including our amazing Freshers' club nights! Oh, and did we mention? We also run an on campus shop! Anyway, we've put this handy guide together to help you explore your new city together and discover the very best it has to offer. Let's do this! 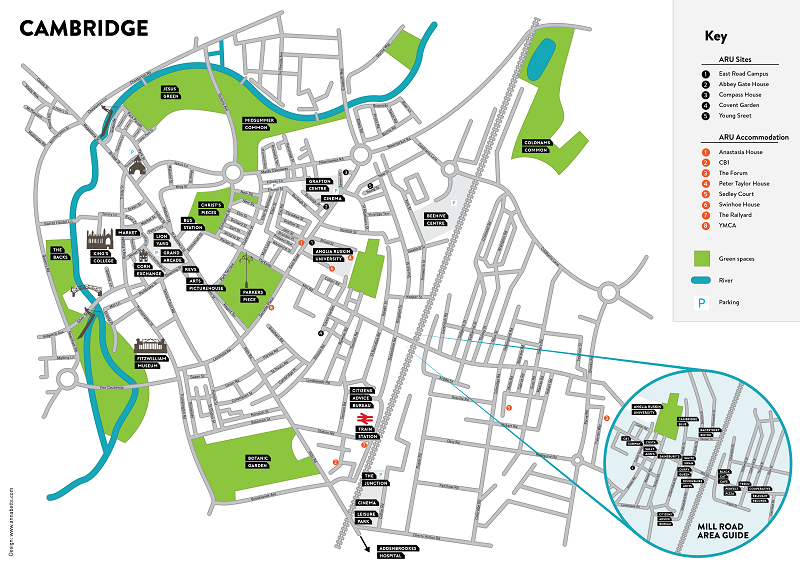 Click here to download our full size map of Cambridge with all the best places on. Cambridge is a model cycling city! Did you know that one in five journeys in Cambridge is made by bike? There are cycling lanes everywhere in the city area and some amazing cycling paths connecting Cambridge to nearby villages and towns. Click here to download the Cambridge cycle route map. There are many good bicycle shops in Cambridge area if you are thinking on buying a new or used bicycle, just walk around the city and have a look at the various options (type and money wise) before you make up your mind. Here's some handy tips about buying second-hand bikes. Check your lights and brakes before setting off. Park & Ride - Many students travel into the city on the Park & Ride bus service. This operates frequent buses from five car park locations on the city outskirts into the city centre. Citi Bus Network - There is an excellent bus service around the city, including a night bus on Friday and Saturday nights.Train - Cambridge rail station about a 20 minute walk south of the city centre. The brand new Cambridge North station opened in May and also provides direct links to London. Trainline.com provides information on routes and fares, offers cheaper than average advance booking rates and lets you check train schedules and buy tickets. Don't forget to buy your 16-25 railcard to save a third off train fares. Train - Cambridge rail station about a 20 minute walk south of the city centre. The brand new Cambridge North station opened in May and also provides direct links to London. Trainline.com provides information on routes and fares, offers cheaper than average advance booking rates and lets you check train schedules and buy tickets. Don't forget to buy your 16-25 railcard to save a third off train fares. Mill Road - Our fave! It's a great cultural mix with lots to experience. Grafton Centre - Home to all the big brands. Grand Arcade - This is the super modern shopping centre right in the middle of town, expect to see high-end brands here. Tesco - For all your essential food need hit up the Newmarket Road Superstore. The Beehive Centre - Just a 15 minute walk from campus, the Beehive has a huge Asda, a Marks & Spencer (if you're feeling fancy), and loads more shopping essentials on offer. Cambridge is well known for its green parks and open spaces situated throughout the city and the surrounding areas – you don’t have to go far to find a place to sit back, relax and enjoy the sunshine on a warm summer's day. There's plenty on offer here too as Jesus Green hosts the annual beer festival, Parker's Piece the bonfire night fireworks display and Christmas icerink and, despite being in the city centre, Midsummer Common is home to a herd of cows over the summer months! It might help you in a quiz one day! 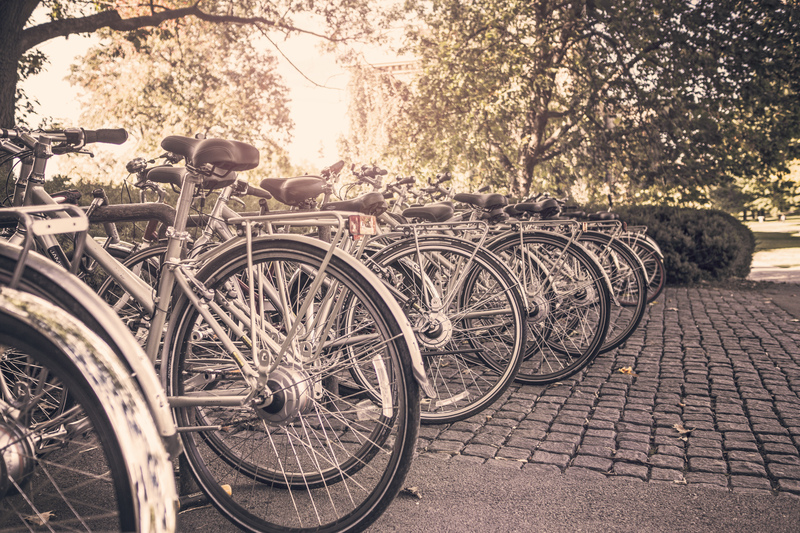 The city boasts over 80 miles of cycle lanes & routes offering a quick & easy way to travel throughout the city, whilst cutting down on your carbon footprint. The mathematical bridge which crosses the River Cam was designed by Isaac Newton and is held together only by gravity with no nails, screws or fixings. Years later, students took it apart to try to understand how it worked, but couldn’t put it together again without screws and nails! Actually...This is the story told to tourists, because although the bridge is wonderful, Isaac Newton died 22 years before it was built! The first official game of football with rules we would recognise was played on Parker’s Piece, the big public park in the middle of Cambridge.